Thinking of the title in conjunction with the painting, we can say that chain mail is a material that might have a certain metaphoric bearing on the practice and nature of painting, that it is, for example, topologically interesting in the way an interconnected linear network makes up a continuous, flexible surface, or that it is an armour designed to shield the individual. ‘Blue Weave’ and ‘Chain Mail’ could be said to mimic the weave of the canvas. In each, organised patterns link spaces together. You could also say that they create spaces, and that these paintings are more about the texture or structure of pictorial space than about things within that space. On this reading they are very elemental paintings, examinations of the basic constituents of painterly language. A painting is a surface. Many of these paintings pointedly refer to different kinds of surface. To skin in ‘Lacerations’, perhaps a flag in ‘Icon’, stone in ‘Ogham’ no. 1, a woven fabric in ‘Tapestry’ and ‘Blue Weave’, armour in ‘Chain Mail’. There are also the various actions and operations enacted on these different surfaces: chiselling in the dry ‘Ogham’, cutting and stitching in the ‘Lacerations’, and weaving, drawing together disparate strands in ‘Tapestry’ or ‘Blue Weave’. 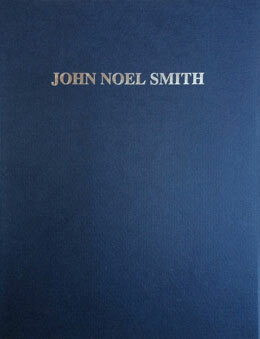 John Noel Smith – Paintings 1992-1995.